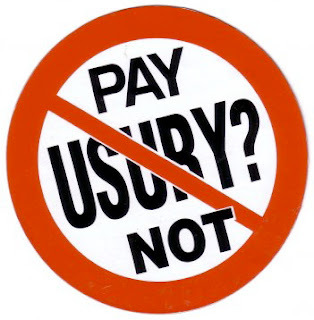 "UsuryFree Living" is the Alternative to "Living With Usury"
There was "Life Without Usury" and there will be 'Life Without Usury" again - in the not-too-distant future. Debtors are beginning to realize that when they sign their name on the promissory note shoved across the desk of the creditor (banker) they are risking their assets and surrendering their power. With a little research and re-education about modern money creation, more and debtors are awakening to the fact that the creditor (banker) is risking nothing because brand new money equivalent to the principal of any loan or mortgage is created by the click of a mouse after the promissory note is signed by the debtor. Debtors are becoming aware that the creditor (banker) never creates the usury (interest) portion of any loan or mortgage. Adding a little common sense, debtors are quickly realizing that they are being conned by the creditor (banker) to sign an impossible contract when they request loans and/or mortgages. Our orthodox, economic system of usury-based, debt money has been faltering and failing at a rapid rate as we progress into this 21st century. Awakened debtors know that the curent economic chaos is more by design than by accident. Astute debtors often ask: "How can we change the paradigm when the banking cartel has their JUSTUS court system to protect their selfish and greedy interests?" Usuryfree creatives from all over the world are answering that question by implementing creative economic strategies that are facilitating the re-birth and regeneration of local communities. While the usurers and their ilk laud return on investment as the ultimate goal, usuryfree prosperity is trumping their usury greed by promoting the concept of "shopping locally" and using a usuryfree community currency as a complement to their diminishing amounts of federal cash. Indeed, the shift towards usuryfree living is well underway. While the legitimacy of the orthodox, economic system of usury-based, debt money is crumbling, the launch of usuryfree community currencies is happening in countless communities and all who choose to participate are benefitting. In countries all over the world, debtors are doubling as active, usuryfree creatives, rising up and embracing the usuryfree community currency movement as the last, best hope to save ourselves from forever becoming economic slaves to the banking cartel's vision of their New World Order, cashless society - where an electronic, usury-based currency rules supreme and tracks every transaction of every consumer on planet earth. The birthing process of this n ew era or peace, prosperity and abundance for everyone on planet earth has not been easy. However, the Occupy Movement that commenced in the fall of 2011, has accelerated the awareness of debtors to the real possibility of experiencing usuryfree living in this incarnation. It was during the deep recession of the early 1980's that these modern models of usuryfree bartering/trading emerged. Michael Linton was the visionary who created the usuryfree LETS (Local Employment Trading System) software in the darkest days of that 1980's recession. Michael Linton lived in the Comox Valley, in the Courtenay area of Vancouver Island, British Columbia, Canada. John "The Engineer" Turmel then financed the development and distribution of the usuryfree LETS software. When the usuryfree, LETS software was fully operational, people (debtors) living in the local community of Comox Valley, were invited to share their contact details complete with a listing of "offers" and "requests." A database was created and participants were invited to negotiate trades using a concept of barter currency referred to as "greendollars." Participants phoned in their trades to a local office and a (sysop) system operator transcribed the trades from the answering machine to the usuryfree LETS software. Every month the participants were mailed a complete statement of their "sales" and 'purchases" and a final balance. This statement resembled a typical bank statement of "credits" and "debits" and the only difference being that there was no usury (interest) exacted on negative balances and there was no usury (interest) paid on positive balances. Each month, the local office debited the account of each participant a small fee in "greendollars" to pay a fair wage to the sysop and to cover any office expenses. Over the past 30 years the original model of the usuryfree LETS software has morphed so that there are now various hybrid models functioning in local communities all over the world. Evidence suggests that the most popular model of usuryfree banking software is the usuryfree, time currency model. Our pick of the longest running and most effective trading model of usuryfree banking is Ithaca Hours which was launched in Ithaca, New York in 1991 by the visionary, Paul Glover. More recently, Wayne Walton has been the pioneering activist responsible for launching Mountain Hours in Summit County, Colorado while motivating other small communities to do likewise. Wayne Walton offers an abundance of helpful video clips and other resources for any usuryfree creatives who are motivated to launch a usuryfree time currency in their respective local communities. Over the years, various small communities have launched usuryfree, time currencies, but it seems that until the present time, there was not sufficient economic pain being experienced by debtors to motivate them to change their shopping habits. For example, in 2004, Tamworth Hours were birthed in rural, eastern Ontario, but after four years the project was shelved because local consumers preferred to drive to urban centres (Kingston, Napanee, Belleville, Ontario) thinking they would save a few pennies by spending their money with the giant, trans-national, retail corporations - rather then being committed to supporting local entrepreneurs who were willing to negotiate trades/exchanges and acccept a percentage of Tamworth Hours with a percentage of federal dollars for the purchase of products and/or services. Now in 2012, the economic models are transforming and since more debtors are awakening and experiencing higher degrees of economic pain, they seem more motivated to become locavores and support localization and the re-building of local community. Re-building community is becoming part of the revised, economic DNA and this is especially evident in Greece where the usuryfree community currency movement has been blossoming and thriving after their orthodox, economic model of usury-based, debt money collapsed in 2011. Readers are invited to read and re-read these recently published articles that reveal how Greek communities are surviving within the usuryfree community currency movement. Indeed, there is an alternative to competitive, monopoly capitalism and that alternative is co-operative, usuryfree living where everyone who chooses to participate experiences peace, prosperity and abundance. Early in 2012, UsuryFree Radio surfaced to foster and promote the usuryfree resolution which simply stated is to live usuryfree. Wayne Walton was instrumental in launching weekly, UsuryFree Radio with George Whitehurst from 11:00 AM until 12:00 NOON every Wednesday. Indeed, it is more empowering for debtors to foster and promote the usuryfree resolution rather than fighting a nousury revolution. The ultimate goal is to invite the greatest numbers of local consumers and the best manner of doing this is to invite municipalities to implement The Innovative Proposal. Such action would immediately resonate with every homeowner and business owner in any municipality, who is compelled to pay property taxes to his/her local municipal government. The key question is: "Which municipality (Canada, USA or elsewhere) will lead the way and take immediate action to implement a usuryfree, time currency?" I daresay that the municipality that leads the way will quickly alter the local, economic DNA and every local homeowner and business owner will reap the benefits. Then other municipalities will beat a path to their door asking: "What are you doing and how are you doing it?" In fact, there is quite likely a business opportunity here for a municipality to market the concept to other municipalities for fair financial gain. The pioneering, usuryfree creatives are an unstoppable force and they extend an open invitation to debtors (individuals, families, businesses, all levels of government and countries) to familiarize themselves with the usuryfree, community currency movement as it has the power and potential to usher in a new age of usuryfree living so that every debtor will have the opportunity to experience 'peace and plenty' by 2020 - a Buckminster Fuller prophecised in the mid-20th Century. Readers are invited to review the history of UsuryFree Day and Week from November 13th to 19th every year since 2005 by searching for "UsuryFree Day and/or WeeK" at any search engine. Likewise, usuryfree creatives everywhere are invited to plan local events to celebrate the forthcoming Eighth Annual UsuryFree Week from November 13th to 19th, 2012. 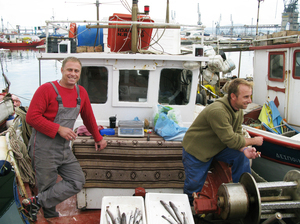 It's Sunday in Volos, a fishing village nestled in a large bay in central Greece, and fishermen display their daily catch, which this day includes codfish, sardines and octopus. Prices have been slashed, but customers are few. Fisherman Christos Xegandakis laughs bitterly. He says business is so bad, it's time to start swapping goods. "Give me two kilos of potatoes, and I give you a kilo of fish," he says. "Why not? Indeed, many in debt-ridden Greece — where radical austerity measures have led to soaring unemployment, business closures and a credit crunch — are doing just that: turning to a simpler form of commerce, bartering. And in Volos, a barter system is also fostering a new sense of community. In Greek mythology, Jason set sail from Volos in search of the Golden Fleece. More recently, the town of 100,000 people was one of the country's most industrialized. But the recession hit its cement and steel factories hard, and now unemployment there tops 20 percent — higher than the national average. A local veterinarian's office and shop serves as an informal community center. In this time of crisis, Volos residents come not only for their pets but also to exchange advice and information. Teacher Alexandra Tsabouris firmly believes in self-sufficiency, as her parents did during World War II. "If you have a garden, if you cultivate things, if you reduce your needs, if you don't have needs anymore, only in this way," she says. Liana Papanaum, who lost her job as a secretary, has chosen a more communal approach to make ends meet. "For example, I have a young couple near me, they have two small children. So I say, 'Could you please do the ironing for me, and I will teach English to your ... children?' 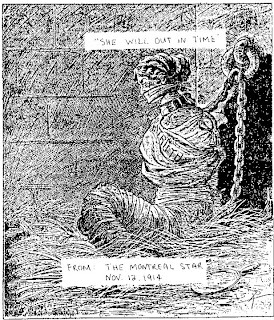 " she says. In Volos, optician Klita Dimitriadis accepts partial payment in Local Alternative Units, or TEMs. She then spends the TEMs at a monthly farmers market, or exchanges them for other services. Volos is also one of several Greek towns with a more formal type of barter network, which uses a currency called Local Alternative Unit, or TEM in Greek. One TEM is equal in value to one euro. People sign up for free on the barter network's website, where they can post ads on what they can offer or what they want. Members exchange goods and services — for example, English and computer lessons, baby-sitting and plumbing repairs, medical visits and car-pooling — amassing TEM credit into an online account. Some shops also accept TEMs, in the form of vouchers that function like checks. Optician Klita Dimitriadis explains how it works. On a pair of 100-euro glasses, she'll take 30 percent in the alternative currency. She needs the 70 euros, she explains, in order to pay her employees, taxes and rent. Dimitriadis then spends her TEMs at a monthly open-air farmers market, or in exchange for other services. Over the past year, TEM members in Volos have grown from a few dozen to more than 500, and the movement has attracted Athens' attention. In September, parliament passed a law giving barter networks nonprofit status. The Volos municipality also actively encourages the TEM network. Mayor Panos Skotiniotis says initiatives like these are particularly valuable at a time when the economic crisis is dismantling so many social benefits. "This is a substitution for the welfare state, and that is why this municipality is encouraging it and wants it to grow," he says. The municipality has printed leaflets explaining the barter system and has promoted panel discussions. Christos Papaioannou — one of the TEM network's founders — says the worse the crisis becomes, the more people feel confused and at a loss. "When they lose their jobs, the whole world collapses, they have to believe in themselves, not in the power of money and their employer," he says. What is a community currency and why would anybody want to use one? "Hundreds of communities around the world have created new currencies over the last few decades, trading millions of dollars’ worth each year. In Canada, at least Calgary, Toronto, and BC’s Salt Spring Island are taking part. 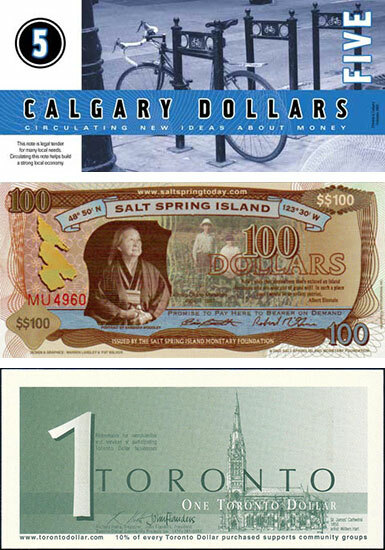 While only the Bank of Canada can print paper to serve as legal tender, it’s perfectly lawful for any Canadian community to make its own alternative currency as long as it records transactions and files taxes — which means this currency needs to be exchangeable with the national dollar. By their design, community currencies force people to spend locally, and usually quickly. They often stand as pillars of community-led attempts to rejuvenate depressed economies, such as Totnes and Brixton Pounds in the UK’s Transition Towns, and Argentina’s wide adoption of the Crédito during its 1999 economic crisis. 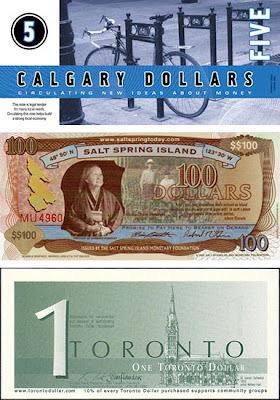 Most are managed by nonprofit organizations, who sell them in exchange for legal tender (one Canadian dollar buys one Calgary Dollar, for instance). The managing NPOs frequently have a surplus of funds (often from business participation fees or expired non-redeemed notes) that are funnelled into community projects or customer discounts. For example, 10 percent of all spent Toronto Dollars is donated to local charities, while the German chiemgauer, which started as a school project, has raised €100,000 for charities. These schemes have roots in the traditional view of money having value because of actual goods or services already produced. For example, in the Middle Ages, a farmer exchanged a bag of wheat for a token, then used that token to purchase a bottle of ale; finally, the ale seller would take the token to the wheat depository to claim his amount. The token had only as much value as the wheat (meaning it lost value over time as rats, rain, and spoilage took their share of the food bags). Today, national currencies still need to be tied to something tangible to have value. The modern centralized economic system uses debt as that value; i.e., the promise that someone will pay off a loan in the future. Banks lend out money based on demand, not on what supply they hold in stock. A bank creates money by crediting a customer’s account, on the promise that the customer will service the debt with interest payments and eventually the full balance. In this way, the value of our money is directly tied to our debt. If you can’t service the debt (as it happened during the US mortgage crisis), then the money has no value. If lucky, a government can step in to boost that up. In a community currency, value comes from actual goods or services, such as the fruits sold by the local grocer, or the tech support to fix your laptop. If a community currency organization issues loans (and some do), these don’t exceed the amount of savings that members have put in. Because a community currency is based on real rather than expected value, the resultant economic system is much more stable, and smaller. Salt Spring Island, British Columbia, an idyllic coastal lake setting between Victoria and Vancouver, is home to one of the world’s most successful modern local currencies. Last year the 10,000-member community purchased $164,000 worth of Salt Spring Dollars, which are accepted by all banks and nearly all businesses in the area. Five percent of all transactions are donated to a charity selected by the customer. A community currency system inherently shifts financial power away from the centre and toward smaller towns. National currency is made by a central bank, flows outward for a brief tour of the periphery, and always circulates back to the central source. A local currency, by being made in the periphery and used exclusively there, gets a lot more circulation in that community. This economic efficiency is especially valuable where jobs are scarce: rather than spending in big box stores where most of the money exits the local economy for remote corporate headquarters, every dollar of your community currency contributes to your neighbour’s income. To encourage faster spending (and even more circulation), some local currencies have expiry dates on bills, or negative interest rates. "As Greece’s economy and the euro continue to struggle, regular Greeks are increasingly taking matters into their own hands, creating informal underground barter markets and even alternative currencies. And the government is actually encouraging it. Over a dozen non-euro trading networks are already believed to be operating in communities throughout the embattled nation, with more on the way. But one effort in particular — called Local Alternative Units, or “TEMs” in Greek — has attracted a great deal of international attention. In the port town of Volos — where unemployment is above 20 percent, the economy is struggling, and tax rates are rising — a group of locals decided it was time to take action. The population still had the same skills and resources as before the crisis, just not the euros needed for commerce. So, a handful of people got together and formed the alternative currency known as the TEM. It quickly took off. And major newspapers and media outlets around the world — from the United States to the United Kingdom — have taken notice as it continues to expand. The TEM system works by allowing people in the community to set up an account on an online network, connecting them with others in the area with various needs and a wide array of services to offer. Users also receive a sort of booklet allowing them to essentially write “checks” to pay for goods and services. 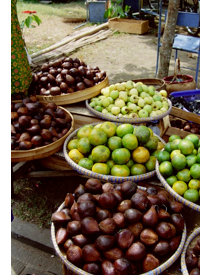 A real market where people can meet to trade in TEMS is also a key component of the emerging network. And efforts are currently underway to establish a daily market in an unused building for locals to engage in commerce using their system. Babysitters, farmers, teachers, electricians, barbers, bakers, computer technicians, opticians, veterinarians, and more are all represented. Most traders accept both euros and TEMs, or some combination of the two. Member accounts start with zero TEMs, although users are allowed to borrow up to 300 units if they agree to repay it over a certain time period. And to prevent “hoarding,” the system’s managers explained, no user is allowed to have over 1,200 units of the currency. "It's an easier, more direct way of exchanging goods and services," German-born homeopathist and acupuncturist Bernhardt Koppold, an active member of the Volos network, told the UK Guardian. "It's also a way of showing practical solidarity — of building relationships." Dozens of other users expressed similar sentiments about their budding system. Co-founders of the TEMs network also explained that if the crisis were to spiral further into the realm of cataclysm, the alternative-currency system could help take up the slack — ensuring that a functioning economy would allow people to continue trading for survival. Even local officials are encouraging citizens to get involved. Volos Mayor Panos Skotiniotis, for example,told NPR that such initiatives are especially valuable during the economic crisis as the government struggles to pay its bills. "This is a substitution for the welfare state, and that is why this municipality is encouraging it and wants it to grow," he said. The local government has even printed leaflets explaining the system and helped promote panel discussions about it. At the national level, politicians seem to support the idea, too. Late last year, the Greek Parliament even passed a law urging citizens to build non-traditional forms of “entrepreneurship and local development.” The legislation also granted the informal networks official non-profit status, helping to ease the tax burden on struggling Greeks saddled with massive debts imposed by national and international officials. And around the world, the system has attracted praise from a broad array of commentators. “With so many fictional stories about how people will turn on one another in the event of a collapse, it's great to see a real-life example of folks who band together to make things work during tough times,” wroteLauren Davis with the online service io9.com. The Greek police union has threatened to arrest international officials for attempting to foist even more misery on the nation. But that has not deterred the EU or the predatory IMF and World Bank from pursuing the same trajectory — saddling citizens and their unborn children with unpayable debts in perpetuity rather than allowing a default and an exit from the disastrous single currency. Still, despite hostility from the “establishment,” alternative currencies are flourishing all over the world. In Germany, for example, some two dozen regional non-official monetary systems have emerged since the birth of the euro. In the United States, despite the high-profile prosecution of Liberty Dollar founder Bernard Von NotHaus, more than a few alternative currencies are already in circulation as well. Examples include Detroit “Cheers,” “BerkShares” in Massachusetts, and “Ithaca Hours” in New York. So-called digital gold currencies are also attracting more and more users. And an online currency system known as "BitCoin" has gained a tremendous following in a relatively short period of time. And at the state level, even governments are taking action. Utah, for example, officially made gold and silver into legal tender last year. And several states are considering similar legislation as the Federal Reserve and the U.S. dollar come under increasing pressure. Even as alternatives to the global debt-based fiat monetary regime continue to expand, however, there is a concerted effort underway by top officials worldwide to foist a world currency managed by aninternational central bank on the planet. And with the American dollar quickly losing its appeal as the “reserve currency” and the euro under more and more scrutiny, a significant change in the monetary system is almost certainly imminent. Your property and the money that you earn. Lies, deceit and deception are keys to this unscrupulous deal. Are backed by your collateral, indeed you risk a lot. The amount of principal to create, BUT the usury he does NOT. In this way, the banker steals money that he never lends. Created by the rich to prey upon the poor. Of any free will, flesh and blood man, that’s for sure. Empowering we-the-people, locally, nationally and globally. Tomorrow, March 24, 2012 is International Cash Mob Day! We are officially less than two weeks out from March 24, 2012 – aka International Cash Mob Day! It was suggested that we put together a draft press release for Cash Mobbers to send out via email. I’ve put one together below; fill it out with your information, then send it out to all of the local media outlets in your city. 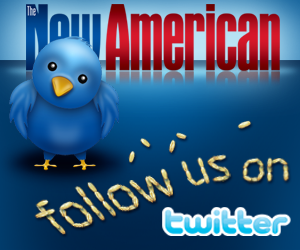 (Tip: try to get it to a particular reporter/producer or to the station’s general Tips or Suggestions email addresses.) If you have any questions or suggestions, please don’t hesitate to email us – this is completely malleable, and it’s the first press release I’ve ever done, so I could use some constructive criticism! 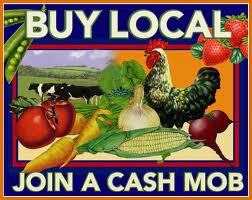 Cash Mobs is a new movement aimed at supporting local businesses and rebuilding communities. A Cash Mob is a Flash Mob, but instead of singing, dancing or rioting, Cash Mobbers join together and each spend $20 at a local business. March 24, 2012 has been designated International Cash Mob Day, and over 170 Cash Mobs will be occurring across the country and around the world. (YOUR CITY) will be joining them. We will be meeting at (LOCATION) and then going to a local store to support it, meet each other and have fun! We would love for you to come out and join us. For more information, go to http://www.cash-mobs.com or contact (YOUR NAME) at (YOUR PHONE NUMBER OR EMAIL ADDRESS). Cash Mobs - The Latest Flash? 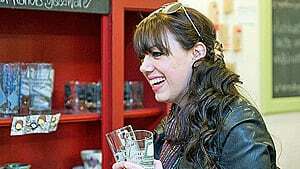 Chara Kingston rang up more sales at her little Halifax boutique on Saturday, March 10th, than she has on any day during the past five years. She made more money in that one day than she did on any other single day in the store's history. Had she advertised a fantastic sale? No. Did a busload of curio-crazed shopaholic seniors disembark in front of Love, Me, her shop that sells Canadian hand-made collectibles and jewelry? No, that’s not the explanation either. Kingston was the beneficiary of a so-called cash mob. It’s a new trend, a play on the term flash mob. But where a flash mob features groups of people suddenly breaking out into a choreographed dance routine in a public place, a cash mob is an organized spending spree at a pre-designated local business. "Today was like nothing I could have dreamed of," Kingston wrote in a post on Yelp.com, the local business website that helped to organize the event. "Nothing I could have prepared for, everything any small business owner should have a chance to experience." Cash mobs are announced via Twitter. Participants know they’ll be expected to spend a minimum of $20 at a local establishment, but they don’t necessarily know where. The business owner is usually given advance notice that the mob is coming, so they can be prepared. The phenomenon started in the U.S., but is spreading quickly in Canada. So far cash mobs have been organized in Victoria, Red Deer, Edmonton, Winnipeg, Saint John, NB and most recently, Halifax. When I heard of them my first thought was "wow, wouldn’t a struggling entrepreneur love to try and get a cash mob organized for their business?" 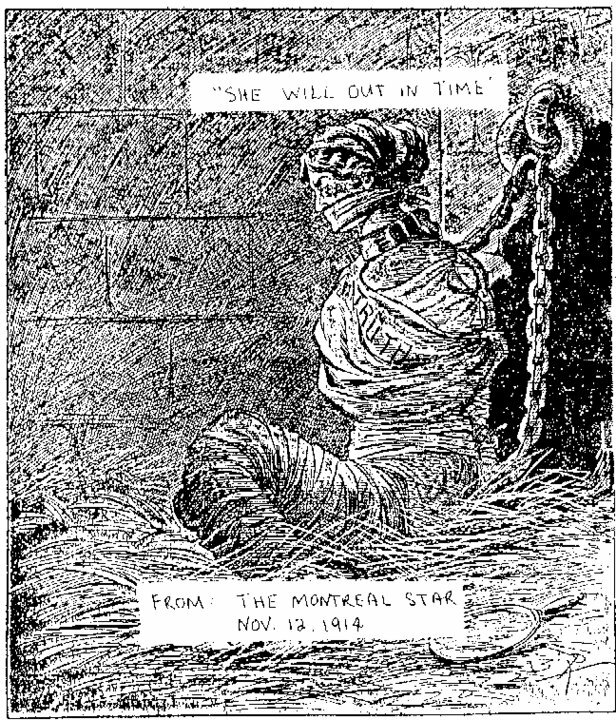 And sure enough, there was indeed a rescue motive behind the cash mob for Chara Kingston. "Someone who uses Yelp told us they love this business," says organizer Ben Boudreau of Yelp.com. "They said the owner had had a rough year. Construction shut down her street for months at a time and she lost a lot of pedestrian traffic. She’s been struggling, and we thought this was a good way to show her the city cares, her customers care." But according to the very loose rules designed by the inventor of cash mobs, Cleveland-based lawyer Andrew Samtoy, the events are not designed to help businesses in trouble. "Some people do it because they want to save a business, and I think that’s a bad idea," says Samtoy. “If a business relies on a cash mob to stay afloat, the business model is probably flawed and they shouldn’t be in business. No business should be relying on this kind of 'charity'." Samtoy organized the very first cash mob just last November, inspired by a trip to the United Kingdom. Unfortunately, the sudden mobs there were not of the entertaining variety. Just the opposite. "I was there just after the riots last summer, and we’d seen all those flash mobs happening and how destructive they’d been," he explains. "So I had this idea to go to my friend Candra’s shop Salty not Sweet, and if we all went there and everybody spent twenty bucks, nobody would be out a lot of money but she’d benefit a huge amount. My friend Marty said ‘hey we could call it cash mobs’. So we immediately got an email account, a twitter account and a blog within about 20 minutes." They put together their first one in Cleveland just after American Thanksgiving, and the concept promptly took off. According to Samtoy, 135 different groups have organized a cash mob since. He’s heard from organizers in South Korea, Australia, the UK, Sweden, the Netherlands, Argentina, and Italy. What was surprising to me, though, is that Samtoy’s motivation isn’t just about helping small business. He’s part of a professional leadership group called Cleveland Bridge Builders, and loves that cash mobs help people develop (or even discover) their leadership skills. "One of the best things is that we have people who are organizing cash mobs that have never been involved in any sort of leadership in their lives. They never said I’m going to run for student government, or organize a party. But then they see what’s happening with business, they want to help, and they realize they can organize an event and they can lead it themselves. It’s almost like a leadership confidence booster." Samtoy is also a huge proponent of building communities, and loves that cash mobs bring people together, in person. In his view, too much human interaction is taking place online these days. "I don’t think the online community is what you can call a community,” he says. “Real communities meet face to face. And I think it’s a problem these days that people aren’t meeting or even talking on the phone. They base their friends on how many they have on Twitter or Facebook, and not on how many people they can go out to lunch with." Samtoy has laid out some guidelines of how to organize a cash mob on his blog, including the fact that it’s best to choose businesses that are creating jobs in the community. But they really are just guidelines, not hard-and-fast rules. But not every cash mob is a smashing success. 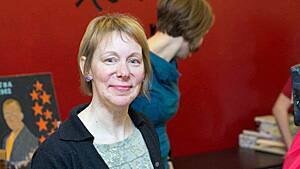 Consider the experience of Angie Gray of Victoria BC. She organized 12 consecutive cash mobs ahead of the holiday season, putting up a Facebook page called "12 Days of Christmas — CASH MOB!." She still believes her efforts paid off, in the sense that the press coverage of her cash mobs brought attention to the value of local business. “It gave people an opportunity to think about where they were spending their money,” she says. As for Chara Kingston, who experienced the windfall of business thanks to the cash mob at her Halifax boutique, her post on Yelp.ca is full of gratitude. NOTE: Adding a usuryfree community currency to the concept of "Cash Mobs" would accelerate the shifting of consciousness and motivate even more consumers to make a commitment to shop locally instead of spending money with the giant, transnational, retail corporations. NOTE: Bookmark this blog for Cash Mobs and visit it often for updates on what's happening with this timely "Cash Mob" phenomenon. 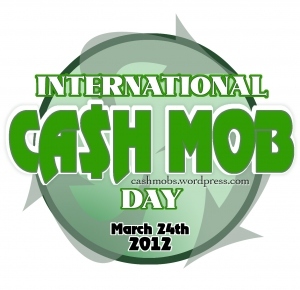 NOTE: Details about International Cash Mobs Day, March 24, 2012.